A hard time ahead right now, as I am typing this, as I am now on my way back home to Visit my Terminally ill MUM, as the Big C has almost won the fight, it is hard when you are so many thousand miles away but I need to see my Mum to say I love her and she will soon be out of pain and resting in a better place. If it wasn’t for her, I would not be here, your MUM is a special person and don’t ever forget all she had done for you, it is not until such times as this that you reflect on the past and wished you could change it, but alas, we cannot but we can celebrate the life that all your family have had and continue it in your own life. The road of life is an interesting highway and sometimes you get lost, take a wrong turn or even break down, but there is always other days when the trip is so fantastic that you don’t want it to end, my journey tomorrow will be a tough one but I know that when MUM see’s me, she will brighten up and she will know that I love her and want to spend this next week with her and my Brother. I will have Dakota taking a handle on a few things to help me out and I am blessed to have him and his Mum and my girlfriend Jennifer, in my life to help whilst I am away. I will answer emails via my Lap top and phone and I will still get your parts out in a timely manner, I shall be back Next Thursday if you need me but you can email me at carpy@carpyscaferacer.com and I will get back to you. My MUM was Born in North London and lived in Enfield ( Middlesex ) in Forty Hill, many cool people have lived in that part of London.And have fond memories of that place. Enfield was recorded in Domesday Book in 1086 as Enefelde, and as Einefeld in 1214, Enfeld in 1293, and Enfild in 1564: that is ‘open land of a man called Ēana’, or ‘where lambs are reared’, from the Old English feld with an Old English personal name or with Old English ēan ‘lamb’. The feld would have been a reference to an area cleared of trees within woodland later to become Enfield Chase. The Royal Small Arms Factory (RSAF) was a UK government-owned rifle factory in the London Borough of Enfield in an area generally known as the Lea Valley. The factory produced British military rifles, muskets and swords from 1816. It closed in 1988, but some of its work was transferred to other sites. 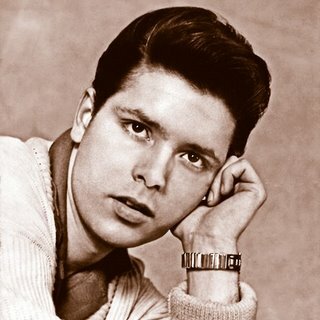 Just for the record… CLIFF RICHARD lived in the house on the junction of PERCY ROAD and COLNE ROAD in the early sixties. 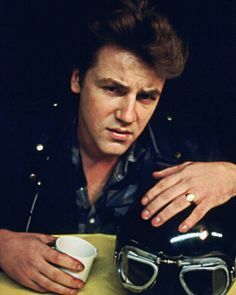 Lenny Davidson,guitarist with the Dave Clark Five who sold 60 million records worldwide in the 60’s..was born in Enfield. Fond Memories of Enfield as My Aunt, Uncle and Cousin and God son are from there but now they live near my Mum in Devon, so comforting to know that she has some family there to support her, My Brother Mick and his wife Pauline have been an enormous help to Mum and I am so thankful for that, feel a little isolated when I am on the other-side of the Atlantic. So, I now take the Big Silver Bird across the water and then a 5 hour drive down to Devon with my Brother and then get to see MUM, I know she will light up when I get there and want to let her know I am here for her and People here in the states are all wishing the best. Thanks so much for the lovely emails, prayers and good wishes sent, it really is muchly appreciated and wanted to thank you from the bottom of my heart. I will Blog as I go along so you can hear how things are going, a tough time for me and my family but I know we ALL have to go through this in some part of your life, just arriving too fast right now. I am looking forward to seeing my Brother as we have always looked out for each other. 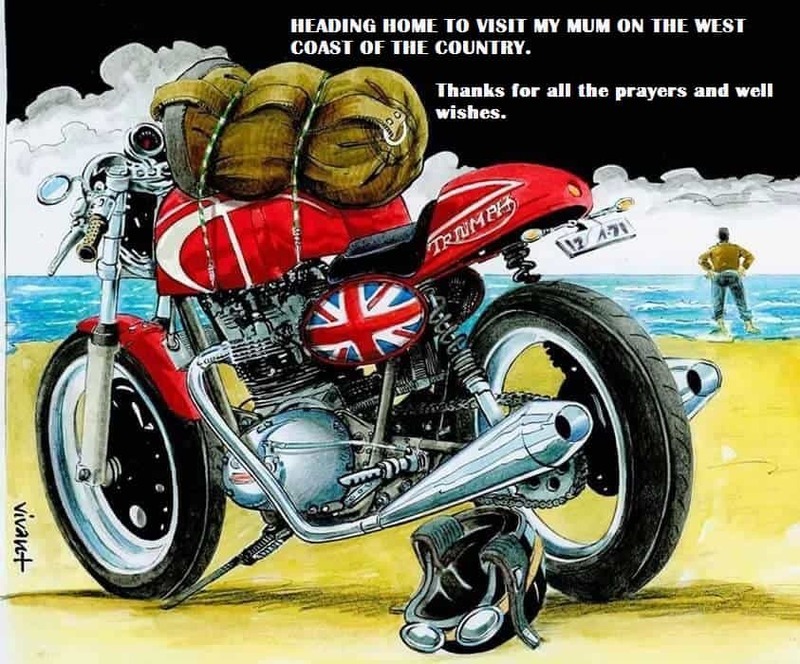 This entry was posted in Blog and tagged cafe racer, london, mom, Mother, mum, paignton, royal enfield, south devon, thruxton, Torquay, trip home, triumph.